You could see the spring coming each day until a night of warm wind would bring it suddenly in one morning. Sometimes the heavy cold rains would beat it back so that it would seem that it would never come and that you were losing a season out of your life. These days, hardly a week passes without the promise of another snowfall, and while I have been waiting for whatever is to follow storms Vulcan and Wiley, I have to hold myself back from sticking plastic yellow daffodils and silk flower lilacs in the ground to fool myself into thinking spring has sprung. But in the spirit of new beginnings, I have found several new series that are helping me pass the time. 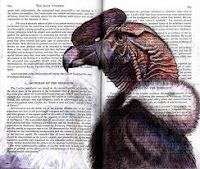 The first is from Maurizio de Giovanni, who started his writing career in Naples, Italy, when he won a writing competition with a short story set in the 1930s about Commissario Luigi Ricciardi. He followed this up with a quartet of crime novels involving this extraordinary protagonist. 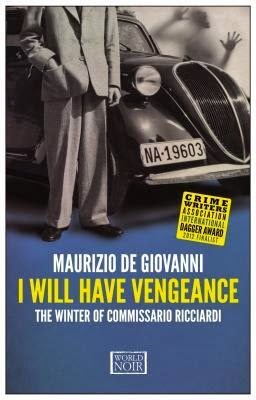 In the first book of the series, I Will Have Vengeance, Ricciardi is one of the most successful of the homicide detectives in the Naples police force. He is a man with no friends, no woman, no social life; just a bunch of scars on his lonely, tormented soul. Still, there is one of his co-workers who is genuinely attached to him, and that is Brigadier Rafaele Maione, his staunch ally and partner. When he was just a boy, Ricciardi was walking in the woods when he saw a man sitting on the ground under a vine. There was a knife protruding from his chest and a puddle of dark fluid was on the ground. The man, who must have been dead, turned to Luigi Alfredo and said, "By God, I didn't touch your wife." Time stood still for the boy. Later on, he always thought of the event as the Incident. He had more such incidents, but he learned to keep them to himself lest everyone think he was nuts. He accepted that he saw the dead. Not all of them, and not for long, and only those who had died violently. Even then, he saw the dead ones only for the short time, fraught with extreme emotion, as they revealed their final thought. Ricciardi felt that being a policeman was probably the only profession that could help him deal with the things he was seeing. 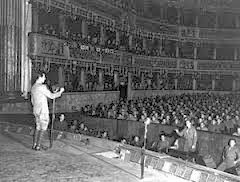 The action takes place during a bitter windy March in 1931 (I can sympathize), in an Italy that is struggling to come to grips with the changes brought by fascism. The police are particularly affected, because they have been told by the authorities that in a well-regulated society, there is no crime––since there is no need for it. Ricciardi, on the other hand, has learned from the Incident that hunger and love are the source of all atrocities––and he is not referring to the goings-on in the more famous Eden. 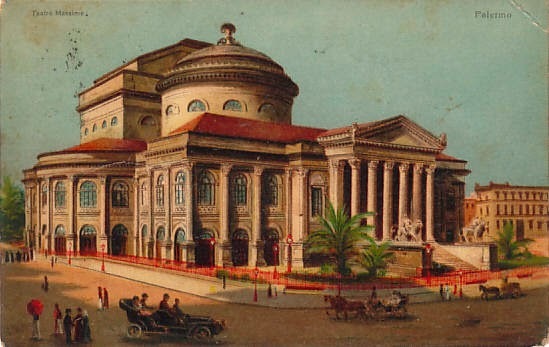 One evening at the Royal Theater of San Carlos during a double opera offering of Cavalleria Rusticana and Pagliacci, one of the foremost tenors in the world, Arnaldo Vezzi, is found murdered. Ricciardi, when he gets to the scene of the crime, has a few moments all alone with the victim and he listens to what the body has to say. In this case it sings, "I will have vengeance," some of the same words heard in the opera tonight. Arnaldo Vezzi was adored by millions and hated by hundreds because he was arrogant, mean and brutal, but the powers that be are up in arms at losing such a famed Italian singer, and Ricciardi has his work cut out for him. In the end, I really wanted to introduce him to Harry Bingham's Fiona Griffiths, a Welsh detective who has something in common with him. She sees dead people too, and talks to them. She could pose the big question of whodunnit, and the corpse could give the answer to Ricciardi. These two detectives would complement each other beautifully and they could kiss their loneliness arrivederci. 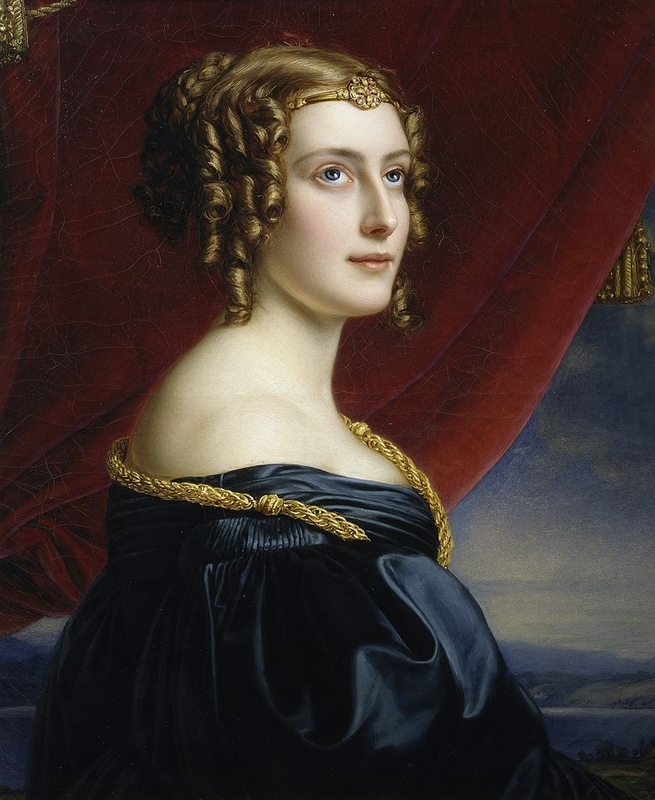 If you liked other mysteries in the operatic vein, like Death at La Fenice by Donna Leon, Murder in the Pit by Erica Miner, Murder Duet: A Musical Case by Batya Gur, Barbara Paul's Opera series or Susannah Stacey's A Knife at the Opera, you might enjoy this story. It is, however, darker, more intense and very gripping. De Giovanni takes the reader back in time, with his descriptions of what ordinary life was like in this part of the world. He uses small details of hair grooming and clothing to help set the scenes in the days of the 1930s. I can't wait to get a copy of the next book, Blood Curse. 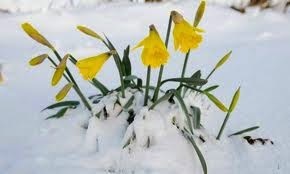 On the other hand, one person's spring is another person's dead of winter. Victoria Houston authors a series that plays out in the lake region of northern Wisconsin. When retired dentist Paul Osborne goes kayaking in late March, looking for likely fishing spots, he calls it spring. When I learned that it still dropped to ten below at night, I would have called it something else. 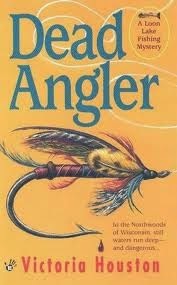 In Dead Angler, the first of the series, Paul is recuperating from the death of his wife, which had led him into an alcohol-fueled downward spiral. But now, in recovery, he has been tidying up his home that fronts on Loon Lake. Deciding to get rid of some fly-fishing gear that he had not used in a while, he takes it to a friend who convinces him to take up the sport again, and he sets Paul up for a few refresher lessons. His tutor turns out to be the recently-installed Chief of Police, Lewellyn Ferris, who just happens to be a female who can really show him a thing or two about fly fishing. The first thing Paul gets on his line, however, is a dead body, hardly recognizable, except that Paul thinks he recognizes the teeth. 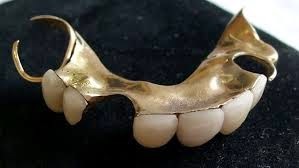 In his youth, Paul had been in the military and was experienced in forensic dentistry. You guessed it! Paul teams up with Lew to help take a bite out of crime and the series is delightful, since it combines murder and mayhem with the poetry of fly fishing. On the breaks from investigating the murder, spending time in the water is the order of the day. Paul is reconnected with the harmony of nature, because he senses that only fly fishing can take you so close to the heart of the water. But he has a lot to learn. This type of fishing is defined by conventions more confusing than a game of bridge. The angler has to have an arcane knowledge of the life cycles of the insects hatching at that very moment––not 30 minutes earlier, and then select the perfect fly to match it. 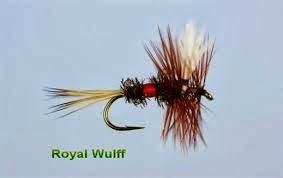 There is a particular movement called "dancing the fly" in which fisherman chooses not to reel in, but to simply dance the dry fly across the currents to tantalize the big ones lurking below. Expert fly fisher that Lew is, she also uses this movement to lure the bad guys into giving themselves up. Houston’s stories are original, with excellent plotting and while I am not in the mood to visit Wisconsin at the moment, I plan to trip my way through this series, because I've developed a small addiction to it. If you are a fisherman, there is another series by Keith McCafferty that has a backdrop of fly fishing in Montana. It begins with The Royal Wulff Murders, which is a fantastic introduction both to the sport and this part of the country. It is endorsed by two of my favorite authors, Patrick McManus and Craig Johnson. The third in the series, Dead Man's Fancy, was published by Viking in January 2014. They feature Sheriff Martha Ettinger and Sean Stranahan, a fishing, painting PI. Xenia is the superstorm that has added a fluffy quilt to the already blanketed East Coast. There is some controversy about the naming of storms but this year the alphabet is getting a workout. I am hoping that at least the storm that has the potential name of Zephyr acts like its name sake and is no more than a light west wind foretelling forsythia and lilacs showing off. MC, it's hard for me to believe that a storm worthy of a name would be called "Zephyr." I vote for Zargon. 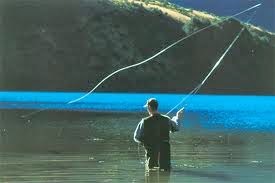 I've wanted to learn how to fly fish for a long time, although it would have to be the catch-and-release type for me. I do enjoy novels set among fishers: Norman Maclean's beautifully written novella, A River Runs Through It, set in Montana, and Cyril Hare's DEATH IS NO SPORTSMAN, involving a murder among fly fishermen on England's River Didder, are two books I enjoyed. Oh, also, in Ngaio Marsh's traditional British mystery, SCALES OF JUSTICE, Chief Detective Inspector Alleyn's case concerns a man who was killed while fishing.